chocolate french toast donuts topped with the new quest mint chocolate chunk bar. i'll let that sink in for a second. i used my 5 minute donut recipe for the base then simply coated the donuts with a chocolate egg mixture, cooked them up like french toast, and topped them with a melted mint chocolate chunk bar for the "frosting". easy peasy and delicious! Combine all ingredients except last 3 and mix well! Make sure to use your hands to incorporate all ingredients into a dough. Pinch off pieces of dough, roll out into a thin rope, and form into a donut. Or form into small balls Of dough and form a hole in the middle with your finger. Repeat with rest of dough. Microwave 2-3 minutes until fully cooked. Set aside. In a Small bowl whisk egg with coconut butter. 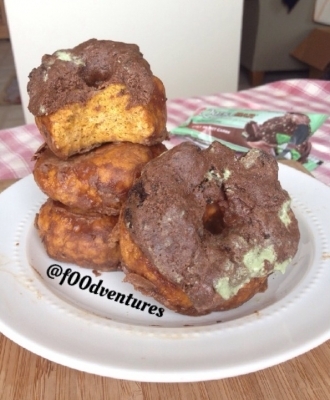 Dunk donuts in mixture and place on a warmed up skillet. Cook a few minutes on each side until fully cooked. Remove from heat. Microwave quest bar for 10 seconds until soft. Pull of pieces of the bar and arrange on top of each donut. Enjoy!